You want to learn how to drain a hot tub but you aren't quite sure where to start? It seems easy enough but there are some common mistakes we see that can lead to costly problems down the road like air lock or contamination. Whether you are draining the hot tub water to replace it with fresh water, draining it to clean the hot tub and filters or you're closing it down for the winter, we can help. No matter how you slice it, a hot tub needs to be drained at least every few months. Even with the most balanced water chemistry and clean filters, there are still contaminants that end up in hot tub water that need to be physically removed. This can only be achieved by a a complete hot tub draining in combination with some other helpful steps we'll go over below. If you've ever run into problems with white water mold, waterline slime or the dreaded hot tub rash also know as folliculitis, you'll understand how replacing the water combined with a thorough clean is absolutely necessary. 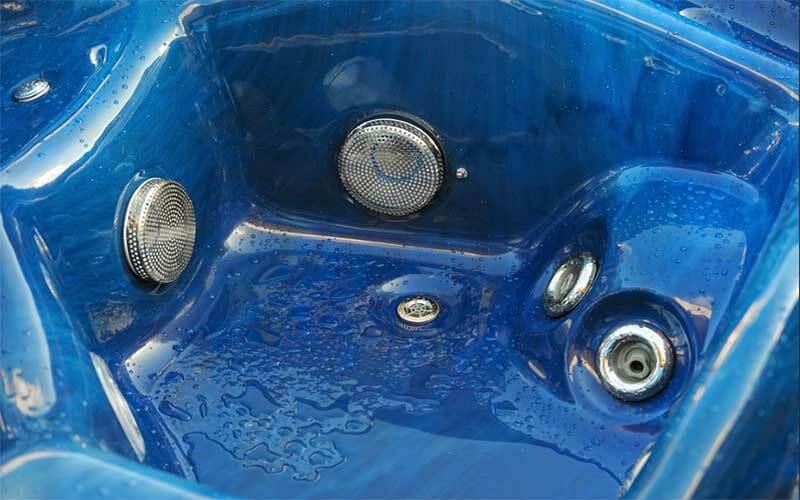 Read below to learn about the best ways to drain a hot tub as well as the steps in-between and after that will help prevent issues down the road. Whatever your reason is for emptying the hot tub it's a really good idea to use a line flush product before you drain the water. It might seem like a waste of time but the reason is that harmful organisms can live in the plumbing where you can't even see them. If you drain the old water out and refill with fresh water, the organisms could potentially contaminate the new water. The line flush should be added to the water as directed and given ample time to work. It's a good idea to remove the filter during this process and allow the circulation system and jets to operate. You may experience foaming, which indicates the product is working. If you notice that the jets aren't clean after one application, repeat and let the product circulate through your hot tub for a longer period of time. After allowing the line flush to do its job you should begin to plan for draining all the water out. We'll go through the steps below that will help you drain a hot tub properly the first time. These step by step instructions on how to drain a hot tub apply to you whether you're refilling it with fresh water, giving the hot tub a thorough disinfectant cleaning or preparing to close the hot tub down for winter. It's a good idea to have a quick read through the instructions so you have an idea of what needs to be done ahead of time. The very first step is to turn the main power off to the hot tub system. The absolute best way to do this is to locate the circuit that controls the hot tub on the main circuit breaker board, and turn it off. The last thing you want is the system to power on when there is no water in the hot tub. There are a lot of different styles of hot tubs so you'll have to do some research for your specific model. You may have a drain or spigot located at the bottom of the tub either protruding from underneath or you might have to remove a panel to access it. It can be tedious to try to use the drain but don't get discouraged because there are other ways. If you manage to locate the spigot, attach a garden hose securely by tightening clockwise. Make sure the hose will empty into a safe area before draining, keeping in mind that storm drains are not a good place to drain the water due to the negative impact on the environment. Most owner's find that draining onto grass or the garden are completely safe, just use common sense and move the hose to prevent flooding one area. If you are having difficulty draining the water using the factory drain or its taking way to long to get all the water out, try using a sump pump. They are designed to pump water fast and efficiently and will make the process go a lot faster. If you are using one for the first time make sure you stay close to your hot tub so you can turn the pump off when most of the water is removed. After removing the majority of the water, the best way to drain a hot tub completely is to finish off with a wet vac or shop vacuum. They are great for getting every last bit of stale water out of the tubs hard to reach areas including around the jets. With all the water out of the tub it's time to give it a good clean. The amount of time you take to clean your tub at this step should be relative to how dirty it was in the first place. If you are performing a simple refill you will most likely spend a lot less time and effort than if you had an outbreak of hot tub rash. The most important thing to clean is the filter and there's no better time to give it a good clean than when it's been drained of all water. A good hot tub filter cleaner will ensure that you're not putting any contaminants back into the fresh, clean water and your water. The basic cleaning should at the very least include a wipe down of the shell, jets and cover. A good hot tub cleaner will do the trick or you can try old fashioned vinegar or bleach in a diluted solution. Try not to use an excess amount of cleaner, vinegar or bleach because they may affect chemistry when you refill the tub. If you need to, use a shop vac to remove any excess cleaner from the bottom of the tub. If you are closing or winterizing the hot tub there are a couple things you need to do before calling it a day. If you don't drain a hot tub thoroughly and follow through these steps before winter you may end up with costly damage to internal plumbing or worse, the shell. You should always refer to the manufacturers instructions for hot tub winterizing especially if you live in a climate that experiences freezing temperatures. The goal will be to remove drains and bleed any excess water from the plumbing before water starts to freeze. You can use a blower or shop vac on reverse to force water out of plumbing and hard to reach areas. A good hot tub cover is worth every penny at this point. After you've taken the time to clean and drain a hot tub there's nothing more effective at keeping it in that condition than a quality cover. You've worked through all the steps on how to drain a hot tub properly and you're finally at the stage where you can fill it back up and start using it again. It should look sparkling clean and shiny by this point including the filter. Make sure that the power is still off and all drains are closed up tight. A garden hose works just fine for this step and we strongly recommend using a fresh water filter that attaches to the end of the hose. It will filter out impurities that can negatively affect the water chemistry in your hot tub like bacteria, carbon, sediment and other contaminants. Place the hose and attachment in the filter well and fill up to the desired level, not too high or too low. Turn the power back on now that you have filled the tub with the appropriate amount of water. The breaker and system can both we turned on to allow the system to start up. This will get the water circulating and heat the water up. A baseline should be established for the fresh water that's been added to the hot tub. This needs to be done every time you drain a hot tub and replace because your local water supply can vary considerably. You should be focussing on sanitizer, pH, alkalinity and calcium just as you do with your regular hot tub maintenance routine. If you are using salt water as your hot tub sanitizer, you should wait until the water chemistry is balanced before adding salt and turning the salt water system on. It's important to achieve balance with pH and alkalinity before producing chlorine with the salt water system. After you have the water chemistry balanced, cover the hot tub and allow the water to reach operating temperature. At this point you should retest the chemistry and adjust as needed. If you have any further questions about how to drain a hot tub contact us with your questions.